This appearance of Captain Atom is just another cameo. It’s as if the creative team just didn’t know what to do with the character. I wonder why they even added him to the line-up. In this issue, Maxwell Lord and Cap have an off-panel discussion about Major Force. 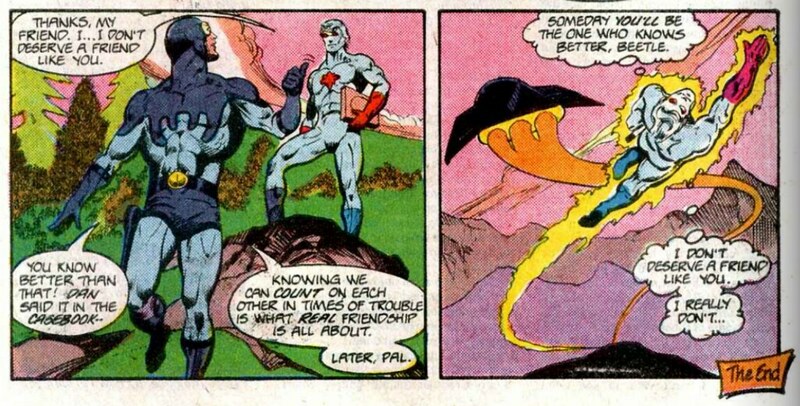 If my memory serves me right, it wasn’t until the foundation of Justice League Europe that Captain Atom really contributed much to the team. When is Nate going to learn to stop relying on “the lie” to get what he wants? It blows up in his face every time! Maybe not right away, but eventually the truth comes out for sad sack Nathaniel Adam. And the lie he spins in this issue marks a turning point in his history. Things are set into motion and his future with the Justice League is at risk. The last time we saw Captain Atom in action was in Justice League International #17. This issue opens in the JLI’s New York Embassy, and right away things look… odd. Not bad at all. Just different. That’s because (for the first time) this issue was not penciled by Pat Broderick. Pablo Marcos did a lot of pencils and inks for both DC and Marvel throughout the 1970s to the 2000s. He did ink Blue Beetle #13 a year prior to this comic’s publication. Mister Miracle and Booster Gold enter the monitor room just as Cap and Blue Beetle are taking off on a mission. They are puzzled by BB and Cap’s new bromance. The mystery is solved when the pair come across a file entitled “Captain Atom Blue Beetle, The Covert Casebook.” I know, I know. Comics. 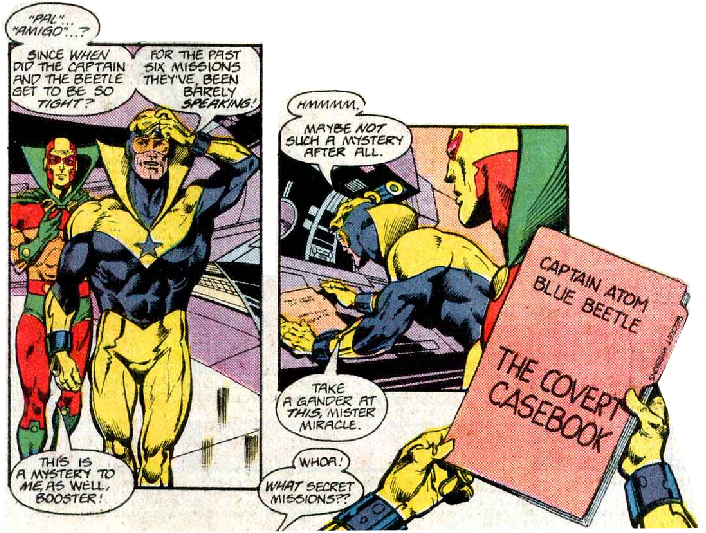 According to the casebook, when Cap was operating in secret (which never happened), he occasionally teamed up with the previous Blue Beetle, Dan Garrett. According to the fake history, Dan tried to convince Captain Atom to go public with his super-heroing years before he actually did. Nate flashes back to the beginning of this latest piece of The Lie. It began one day when he was stocking shelves at Mellow Yellows and Henry Yarrow came in. Yarrow was Nate’s defense attorney in 1968 when he was first put on trial. He’s been trying to find evidence to clear Nate’s name. He’s also gotten a face-lift, as he is on the run from some crime organization that wants him dead. Nate closes up the shop and takes a ride with Yarrow, knowing that doing so will anger Starshine. Yarrow reveals that Lester Bryant, chairman of Zyco Industries, has been buying up small R and D companies. In the 60s, Bryant was one of the Generals who sat in on Nate’s court martial. According to a “deathbed confession” by a “bitter employee,” there is a codebook in a safe in Bryant’s office that incriminates him as a member of a Vietnam, drug ring. Zyco security are on to Yarrow, thinking he is a corporate spy. He can’t break into the office safe, so he gives Nate all the info he has and lets Nate decide how to proceed. Nate decides the best way to proceed is to lie to one of his Justice League team-mates and use him to gain access to Zyco Industries. He meets Blue Beetle in a secluded area where Beetle demands to know how Nate found out he was Ted Kord (Kord Industries was one of the companies purchased by Zyco). 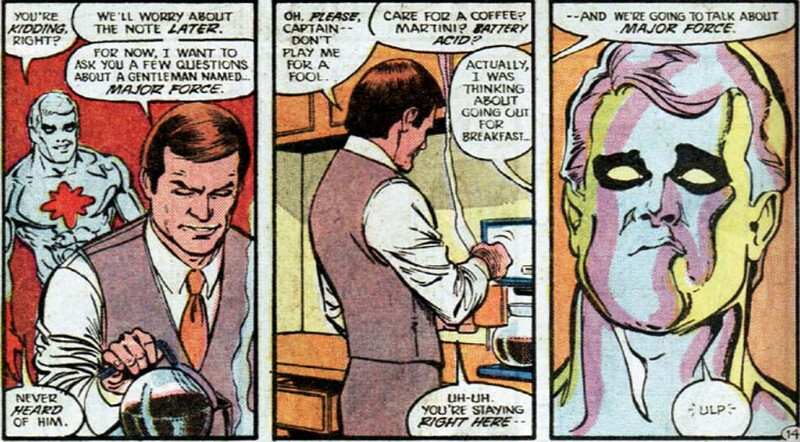 Beetle, who claims he and Atom never saw eye-to-eye since Cap joined the league, asks Nate why he thinks he’d help him. Nate hands him the secret casebook. Blue Beetle reads about a time when Dr. Spectro attacked the first Blue Beetle, Dan Garrett. The Bronze Age Captain Atom came to Dan’s rescue. This story is told in flashback form throughout the book. It is enough to convince Ted, who agrees to visit Zyco. Ted calls on Lester Bryant, who is rather portly. He visits Zyco under the pretense that he is seeking a job with the company. Bryant is all too happy to oblige, and sends Ted off with the lovely Miss Devon to take a tour of the company. As Ted flirts with Devon, mini cameras in his cufflinks are snapping pics, which Beetle and Cap pull up on the JLI computer later on. 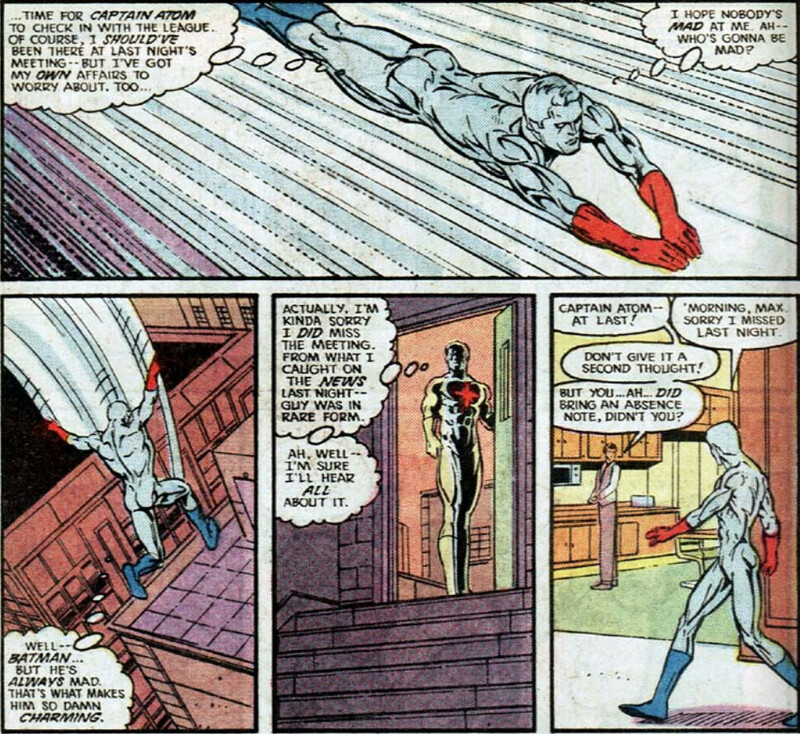 Captain Atom spots the safe behind Bryant’s desk. He opts to listen in on Bryant’s bugged phone while Blue Beetle goes on a date with Miss Devon. Cap feels like crap for lying to Ted – not only about the “secret casebook,” but also that the airman who’s name they are trying to clear is actually Nathaniel Adam. Back at Zyco, Bryant places a call. He tells the person on the other end that he was aware of Ted’s wrist cameras, but clearly isn’t aware of the bugged phone. 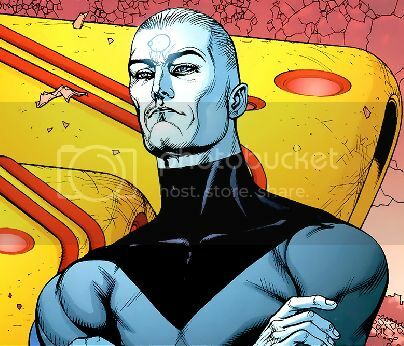 The individual on the other end shares Bryant’s concern about Ted Kord and Miss Devon going on a date, and orders Bryant to have them both killed. Out on the town, Ted pushes Devon out of the path of a speeding taxi. Before the offending cab can speed away, Captain Atom shows up and grabs the driver. Miss Devon confesses to Ted she knows a lot more than she’s let on, and tearfully offers to tell him everything. Later, after he’s dropped Miss Devon off with the police, Blue Beetle meets up with Captain Atom at the JLI Embassy to compare notes. After dropping the would-be assassin off at a nearby police station, Cap went over the surveillance footage and discovered that Zyco’s “research submersibles” are being equipped with military-grade weapons. Miss Devon revealed to Ted that two of these prototypes were sold to major drug rings operating in the Gulf of Mexico. In flashback land, Blue Beetle (Dan Garrett) is strung upside down in Dr. Spectro’s lair. Spectro is torturing the Beetle, hoping to learn his and Captain Atom’s secrets. 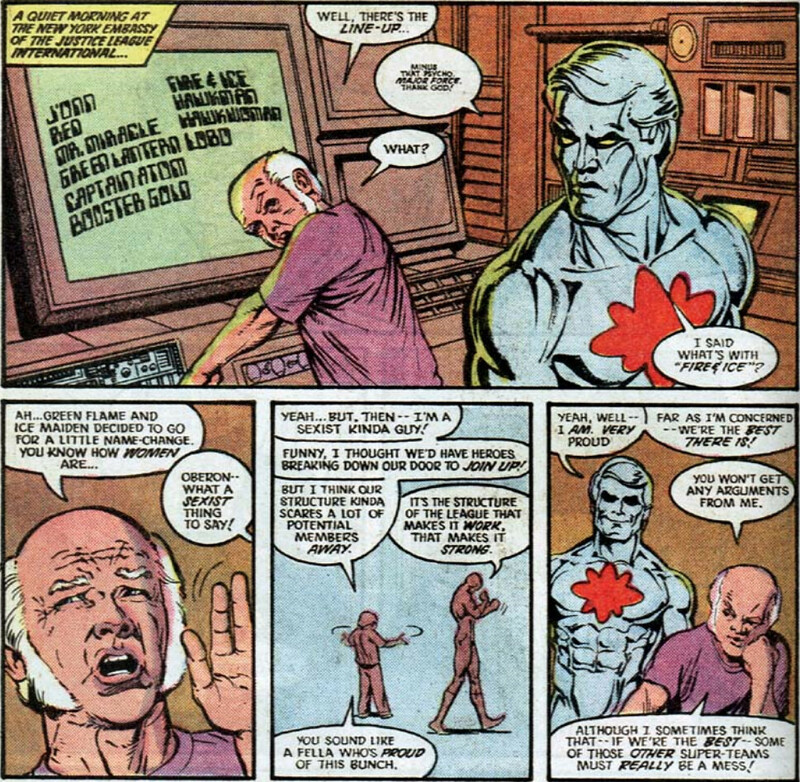 But before Dan can talk, Captain Atom bursts in to the rescue. Back in the “real world,” Cap and Beetle come upon the bad guys testing out their new submersibles on an unsuspecting cruise ship. Beetle swings down to take on the baddies while Cap provides air support. Ted’s plan is to confiscate the subs for his repo business. He shatters one of the canopies but isn’t overly concerned as that is an easy fix. He seems mostly concerned with impressing his business partner Booster Gold. Cap accidentally sinks one on the subs and apologizes to Beetle as he rescues the pilot. The second sub is also destroyed by its’ pilot. Cap thinks Ted will be angry and this actually relieves him. He feels bad for lying to Beetle. However, back on board the JLI shuttle (with the baddies stowed away), Ted tells him he isn’t sore. After all, they have a tradition to uphold. The non-existent tradition of a Blue Beetle/Captain Atom team. 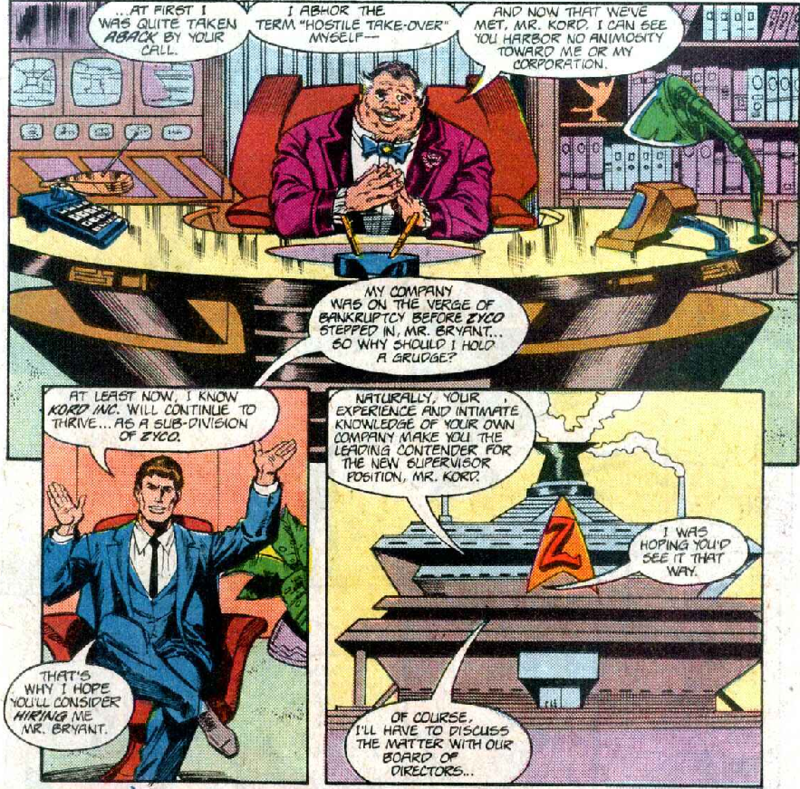 Back at the JLI embassy, Ted and Nate listen in on Lester’s office. He’s on the phone with a very upset third party. They hear and eplosion and take off for Zyco to investigate (this is where we entered this story). They arrive only to find Lester has been killed. The fake flashback story wraps up with old Cap and old Beetle leaving Spectro’s lair and promising to always have each others’ backs. The issue closes with current Cap and current Beetle (after discovering the safe they were looking for was destroyed along with its contents) making the same promise to each other. Cap flies away feeling like a total a-hole for using Ted that way. Which he is. Honestly, did he really think Ted wouldn’t help him without the lie? I mean, they’re Justice League team-mates. Those guys always look out for each other, don’t they? So I give Pablo and Frank and A for art. This was beautiful. I love their take on the Bronze Age Captain Atom and the Golden Age Blue Beetle. And I can’t complain about not having seen Pat Broderick’s take on Beetle, because he drew the cover. Cary and Greg get an A for story, too. I’ve always really liked this issue. It was super fun seeing Captain Atom and Blue Beetle teaming up and I will never not love these two Ditko creations.